How Messi's 100 European goals were scored — On & Off The Pitch Since 2015. Barcelona's Lionel Messi has emulated Cristiano Ronaldo in reaching 100 goals in UEFA club competition; UEFA.com dissects the Argentinian marvel's body of work. 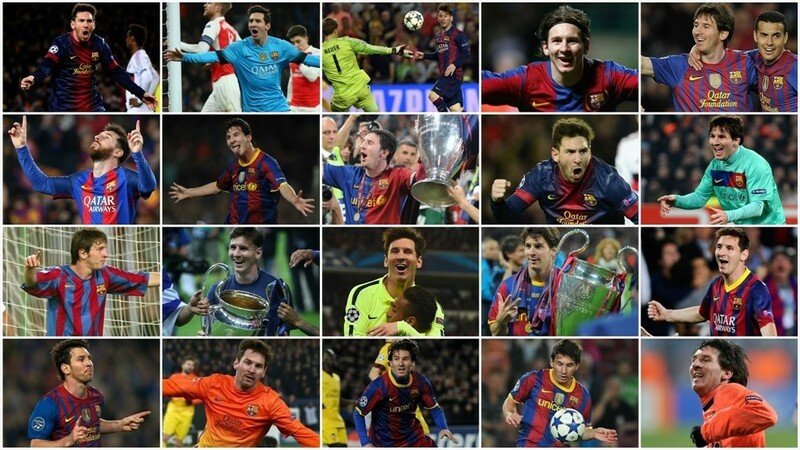 Lionel Messi has scored 100 goals in European competition in 122 games. After watching three matches from the bench, he made his competition debut in a 2-0 defeat at Shakhtar Donetsk on 7 December 2004 – aged 17. 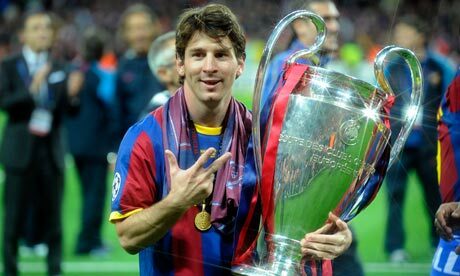 After four goalless outings – and nearly a year after his competition debut – Messi scored his first UEFA goal in a 5-0 thrashing of Panathinaikos on 2 November 2005. It remains the longest wait for a goal in his European career, though he has gone four games without scoring in three subsequent spells: October 2006–March 2007, March–September 2008 and February–April 2015. Messi shares with Cristiano Ronaldo the European record for hat-tricks: seven in total, including one four-goal haul (v Arsenal, 6 April 2010) and five in a 7-0 triumph over Leverkusen (7 March 2012) – the latter tally a first for the UEFA Champions League (group stage to final). Last season he broke further new ground by hitting hat-tricks in successive appearances, against Celtic and Manchester City. Those two trebles heralded a run of five straight games in which he claimed at least one UEFA Champions League goal – ten goals in all from September–December 2016. He had previously registered in a career-best five consecutive European matches from September 2013 to March 2014 (undeterred by missing several games through injury) and September to December 2014. His most prolific period was between November 2011 and March 2012, when he squeezed ten goals into just four matches. The Camp Nou has been Messi's happiest hunting ground in Europe, with 55 of his strikes coming on home soil. He has also netted five times at neutral venues in UEFA Champions League finals and UEFA Super Cup games, plus 40 goals on the road. Messi has been at his very best in the earliest stages of this competiton; his 60 in the group stage and 21 in the round of 16 are both tournament records. He bagged 14 goals in 11 games in his best UEFA Champions League campaign of 2011/12 – and managed an even more impressive rate in 2016/17 with 11 in nine outings. Messi scoring generally means game over for Barcelona's European opponents – they have won almost 84% of the matches in which he has struck. He has scored in a losing cause in only three European fixtures.